The training and consultancy network "euro-workscouncil.net"
is there to inform you about the activities of European Works Councils and related subjects. EWC News appears four times a year. You can download this newsletter as a pdf file and print it out. You can find past issues in the newsletter archives. 1. Will the European Parliament touch up? The European Commission presented its draft text for the revision of the EWC Directive on July 2nd, 2008 to the public. Unlike expected before the draft remains in important points behind trade unions’ demands. It shall be adopted before the end of this year. The hopes focus now on the European Parliament which had expressively demanded an improvement in May 2007 (see report in EWC News 2/2007). Meanwhile the employers' federations run a hard lobby campaign which is particularly turned against the trade union influence on European works councils. When on April 2nd, 2008 became known that the employers' federations had given up their long-standing blockade against negotiations with the trade unions, a pragmatic solution seemed to have moved within reach (see report in EWC News 1/2008). But the European Trade Union Confederation (ETUC) wanted to secure the adoption of the new EWC Directive before the expiry of the European Parliaments' and the European Commissions' period of office and therefore pleaded for “fast track negotiations". When the European employers' confederation BusinessEurope declined this in exploratory talks, the ETUC let burst the not yet started negotiations on April 11th, 2008 and asked the European Commission to present immediately a text of a bill. On April 30th, 2008, the European Commission reacted with the request to the social partners they still may come anyway to the negotiating table. After that the ETUC justified again its rejection in a letter to the president of the European Commission, Barroso. What are European Works Councils? At a meeting on June 9th and 10th, 2008 the ETUC assembled about 250 members of European works councils and trade union officers in Brussels to discuss the current situation with representatives from the politics. A few days later, on June 18th, 2008 the French prime minister François Fillon particularly declared in favour of a strengthening of the European works councils before the National Assembly in Paris. The “revival of a social Europe" is one of the keywords of the French EU presidency in the second half of the year 2008. Symposium on the new EWC directive: what is going to happen? Many EWC members are still not sure about the consequences of the revision of the directive and would like to design their current EWC agreement legally compliant on the basis of the new legal situation. Also works council members who still have the EWC formation ahead would like to include the new regulations early in their considerations. Not least a number of questions will arise also for lawyers after the adoption of the new EWC Directive at the end of the year 2008. The "euro-workscouncil.net" training and consultancy network offers the opportunity on January 26th, 2009 on a symposium in Hamburg to discuss the new legal situation in detail with experts from Brussels as well as from Germany with theoretical and practical background. The symposium is carried out in German. Interested parties in other languages please ask us for the purpose of individual arrangements. We carry out similar events on behalf of regional and local trade unions (see for example report in EWC News 2/2007), an EWC workshop of several days also is in preparation for the ver.di federal office. The costs arrangement is in accordance of § 37, para. 6, of the (German) Works Constitution Act. Furthermore for such events EU funds can be applied for (see item 8 below). On July 1st, 2008 the Polish constitutional court granted a complaint of the Polish employers' federation and declared the works council law, which was passed in April 2006 to be unconstitutional. Within twelve months the legislator must make a new regulation. The law had become effective after intense political discussions and with delay at that time. It transposes an EU Directive of the year 2002 into Polish law, which obligatorily stipulates to inform and consult the workforce in social and economic issues in companies with more than 50 employees. There hadn't been any works councils in Poland before yet and the representation of the staff was an exclusive task of the trade unions -- provided that they had members in the company (see report in EWC News 2/2006). The court declared the electoral procedure, which gives a priority to the trade unions to nominate candidates for the works councils, as incompatible with the negative freedom to form a coalition. It discriminates employees who don't (want to) belong to any trade union. If the verdict should find an echo in other countries, it could for example shake the foundationes of the industrial relations in the UK or France. It virtually means a turning to the German system where the works council is de jure completely independent from the trade unions. Another judgement annoys in contrast the Polish employers. The works council of FSO in Warsaw, once the centre of the Polish motor industry, was anxious about the high number of temporary workers and wanted more exact information about the full costs of this sort of employment. When the employer refused this, it went to court and achieved a success. The company must disclose all figures now. The verdict is regarded as a precedent for all works councils in Poland and set about another twenty legal proceedings into motion in the meantime. From May 14th to 16th, 2008 the Otto Brenner foundation (OBS) held a conference on trade union developments in Middle and Eastern Europe in Kranjska Gora (Slovenia). The OBS is the science foundation of IG Metall and attaches special importance to the adjustment between East and West. Presentations and speeches of the meeting can be downloaded from the Internet as pdf-files as well as pictures and sound. The conference delegates also voiced in favour of a speedy improvement of the EWC Directive. A brief report: Where do trade unions stand today in Eastern Europe? We have arranged on a special page answers to the question which meaning the EU Eastern enlargement has for European works councils. The French Belgian bank Dexia ("Short term has no future") is regarded as a classic example for a social partnership company in this sector. An agreement which assures the European works council of minimum standards at the sale of business activities was signed in Brussels on December 19th, 2007. This is valid both for the time of the information and consultation as well as for the modalities of the process of sales. All potential buyers are asked for a written information, whether they keep the social standard of Dexia and want to guarantee the previous status of the employees after the take-over. Central management of Dexia will make this a criterion for the choice of the buyer. The board of directors decided on the transformation into a European Company (SE) on July 3rd, 2008. Negotiations about a participation agreement shall start in September 2008. On April 2nd, 2008, the European works council and the management of the mineral oil company BP entered into a Europe-wide restructuring agreement which regulates the participation of employees at the relocation of customer service and finance activities. These shall be merged at one single location in a low pay country until 2010. The agreement provides an open dialog with the EWC about project targets and implementation. The employer wants to avoid dismissals through measures of internal transfers, re-training and early retirement. The EWC is involved in the steering group of the management and is given access to all documents, special trainings and can call experts of its own choice. At present an implementation plan with time frame is worked out. An Europe-wide framework agreement on the production of the new Astra and Zafira models was concluded between EWC and central management on April 29th, 2008 in Rüsselsheim (see photo). This agreement is not only a milestone for General Motors but also a political signal of first rank for the development of all European works councils into a full-functional committee of workers’ representation. The plant at Antwerp (Belgium) is protected by another product line. Statement of central management: "only three locations can survive"
As a reaction to this attempt to “divide and rule” all employee representations concluded in December 2005 an "European solidarity promise" with the aim to conduct negotiations on the future of locations exclusively at European and not at a local level. Thus they authorized the European works council to perform their participation and negotiation rights although this is till now not foreseen by the legislator at all. In order to put this on stable grounds a scientific project company was started and financing by the EU was applied for (see report in the EWC News 1/2006). Workers' representatives of the automobile manufacturer Ford from Germany, France and Belgium came together in Brussels on June 3rd, 2008 to prevent the threatening shutdown of the production centre for automatic transmissions in Blanquefort near Bordeaux. They want to outline an agreement at European level and start negotiations with central management about this. Plant shutdowns then would also be no longer a national affair but an European topic at Ford. The take-over of some activities of Alcatel-Lucent by the French electronic group of Thales led to the adaptation of the EWC agreement of 1993 to the new group structure. It was signed in the Parisian suburb Neuilly on December 18th, 2007. In future 35 workers' representatives belong to the EWC, which meets under the chairmanship of the employer, amongst this 17 from France, five from the UK, three from Germany and two each from Italy and Spain. The high French delegate number was necessary to take all trade unions adequately into account. The agreement provides two annual EWC plenary meetings in addition there are for the first time division meetings: twice annual for the areas of defence, aerospace and transport security. The steering committee consists of twelve members (thereof six from France) and meets every two months. The EWC secretary gets 350 hours time-off per annum, members of the steering committee 150 hours and the other EWC members 100 hours. The EWC is supported by the consultancy firm of the French group works council and can engage an additional international expert up to the annual limit of 50,000 €. The EWC in addition gets an annual budget of 16,500 € for other costs in which the costs for meetings, journeys and interpreters aren't credited to this. The new agreement provides for clarity at an important point, which leads to quarrel with the employer in many European works councils again and again. When does an issue have a transnational character? The EWC of Thales is involved if more than 150 redundancies are carried out in two countries or if a restructuring measure concerns more than 500 employees. The EWC also has to be involved in case of fundamental structure changes of the company in only one country. It required a legal altercation to induce the central management of the French conglomerate Bouygues to renegotiate the agreement from the year 1995 (see report in EWC News 1/2007). It was signed in Paris on February 19th, 2008. According to that the European committee for social dialog is changed into a full EWC, which also contains Switzerland besides the EU. Bouygues is active in the construction and property sector, operates a telephone company, has shares in the formerly state television channel TF1 and in the engeneering company Alstom. The EWC consists of employers’ and workers' representatives, which is typical for EWC agreements based on French model. The employees' side sends 12 members from France and 12 members from other countries as well as two trade union delegates, who must be employees of the group. The French delegates aren't elected by the group works council but appointed by the trade unions in which the CGT-FO forms the majority with seven mandates. Countries with which the EU is conducting accession negotiation (at present these are Croatia and Turkey) send observers into the EWC. The employees' side elects a speaker ("secretary") and four deputies, who together form the "office" and get 220 hours each time-off per annum for this mandate. Together with the CEO of Bouygues, who also performs the EWC chairmanship, they form the select committee. In urgent cases the committee meets within 72 hours. The employer bears all costs for meetings, means for work and experts and provides in addition the EWC with an own annual budget of 14,000 €. There is an entitlement of four days training during a four-year period of office. Some passages of the valid EWC agreement of the French tyre manufacturer Michelin were modified in an EWC plenary session on April 2nd, 2008 at the group seat in Clermont-Ferrand. A complete new version shall however be carried out only when the revision of the EWC Directive is completed in Brussels. Starting point for the renegotiation was a threatening lawsuit, which could be avoided in April 2007 in the last minute (see report in EWC News 1/2007). Michelin has an EWC since 1997. The agreement still leaves Switzerland aside but reveals however an observer status in the EWC to all countries with which the EU conducts accession negotiations. The select committee was increased to six members to allocate an additional seat to Eastern Europe. All six must come from different countries. The number of annual meetings was increased from two to four. The information and consultation of the EWC in exceptional circumstances is in future carried out at the same time with the national works councils of the countries concerned. At a meeting in Vienna a new version of the EWC agreement was signed by Siemens on May 29th, 2008. The previous agreement had stopped on the level of 1995 when the "Siemens Europe Committee" (SEC) had been established on a voluntary basis. The most important innovations: the steering committee is enlarged from four to five members, the mandates are in future bound to certain regions, namely the Northwest, the Southwest and Eastern Europe. In addition to the annual plenary meetings so-called "cluster meetings" where the SEC members of the respective region meet the management take place once per year. These new regional committees are informed and consulted in matters, which concern their respective countries. This actually means doubling the meeting frequency, because before the electrical company didn't go beyond the legal minimum requirement of one annual meeting. For the Beaulieu International Group an EWC agreement was signed according to Belgian law on February 28th, 2008. The company with seat in Waregem (West Flanders) is family owned and manufactures floor coverings and furniture textiles. The EWC is composed according to Belgian habits: 18 management and 18 workers' representatives from Belgium, Germany, France, Spain, the UK and Norway, who meet once a year, belong to it. An additional extraordinary meeting is possible, there is no steering committee. An EWC agreement was signed according to British law for the second greatest logistics company of the world on March 14th, 2008. Ceva Logistics with seat nearby the Amsterdam airport resulted from the merger of the Dutch TNT Logistics with the U.S. company Eagle Global Logistics (EGL) in August 2007. Both belong to the U.S. finance investor Apollo Management. 30 members from 16 countries belong to the new EWC, which meets once to twice every year. Further meetings are possible in extraordinary cases. The steering committee consists of four members. The agreement provides training measures as well as the support by experts. An agreement on the formation of a European works council was signed for West Pharmaceutical Services on March 31st, 2008 (also see report in EWC News 1/2006). The U.S. group produces rubber and synthetic material parts, which are used for the packing of drugs. Two delegates each will belong to the EWC from Germany, France and the UK; Denmark, Italy, Spain and Ireland send one delegate each. Meetings take place at the seat of the European management in Eschweiler near Aachen once a year for three days, the meetings are carried out in English without interpreters. In urgent cases the EWC chairman can visit locations in other countries, he and his deputy get twelve days time-off per annum in addition to the annual meetings, all other EWC members get six days per annum for EWC matters. The constituting meeting is planned for the end of August 2008. The economy of the Grand Duchy doesn't only consist of banks and steelworks. A smaller "global player" is the Monier group, manufacturer of roof building-materials. The agreement signed on June 17th, 2008 provides a 15-headed European works council, which meets once a year. The CEO and the EWC secretary take turns in the chairmanship every year. Some countries were combined to groups which get respectively only one mandate (e.g. Belgium and Netherlands). The EWC is also responsible for Bosnia, Croatia, Serbia, Switzerland and Turkey. The EWC elects an "executive office" with the secretary, its deputy and another three members, who meet three times a year. In exceptional circumstances a special session of the office takes place to which delegates of all countries concerned are invited. Besides the participation in meetings the secretary gets 100 hours time-off per annum, the further members of the office 70 hours and all other EWC members 30 hours. The EWC is entitled to training for four days per four-year period. On June 18th, 2008, an EWC agreement was signed according to Italian law for Buzzi Unicem to which the Dyckerhoff group also belongs since 2004. There was already since 1996 a seperate EWC at Dyckerhoff according to German law. The new EWC consists of 15 members: six from Italy, four from Germany and one each from the Netherlands, Poland, Luxembourg, Czechia and Slovakia. They meet once per year as well as in extraordinary circumstances. Remarkable: all countries with which the EU conducts accession negotiations are invited to the EWC meetings as an observer. The EWC forms a steering committee from five members (three from Italy and two from Germany) who at least meet twice every year. Call centre with a "long line"
EWC negotiations are limited by the legislator to three years in which the special negotiation committee (SNB) must be called within six months for the constituting meeting. Nevertheless there are cases in which negotiations take place substantially later and under quite unusual circumstances: so at Transcom WorldWide, a call centre and collection service provider based in Luxembourg, which belongs to the portfolio of the Swedish finance investor Kinnevik. Although the application of the formation of the European works council was already made in March 2004, the special negotiation committee met for the first and only meeting in Barcelona from June 30th until July 2nd, 2008. A narrow majority was found in a crucial vote among the 16 workers' representatives from 16 countries for the signing of an EWC agreement based on Luxembourg law. The EWC will consist of 23 employees and several employer representatives, meet once a year and elect a coordination team, which can interact via video conference. The constituting meeting is planed for April/May 2009. The texts of numerous EWC agreements are available on a download page. Since June 27th, 2008 Knauf Interfer with seat in Essen (formerly Stinnes Stahl) has signed as a European Company (SE). Before a SE participation agreement had been signed on April 8th, 2008. The steel trade group has branch offices in Austria, Poland, Hungary and the Netherlands. The supervisory board consists of three members, amongst this is one workers' representative. A SE works council is founded on the basis of the legal minimum requirements if the staff number exceeds 250 outside Germany. Until then the German group works council takes over the tasks of the SE works council, all countries with more than 50 employees can send guests to the group works council meetings. Growing into the equal participation of workers’ directors in the supervisory board is particularly excluded in the agreement. A SE participation agreement was signed in the Cologne raw material and recycling company Interseroh on April 15th, 2008. The negotiations had started in January 2008 (see report in EWC News 4/2007). Since there is no participation in the present German supervisory board, the future SE supervisory board also remains without employee participation. The SE works council will consist of nine members although before 17 members had belonged to the special negotiation committee (SNB). The SE works council will be the first transnational committee of workers’ representation at Interseroh, there hadn't been any European works council before yet. The entry of the Interseroh SE in the register of companies is planned for autumn 2008. A SE agreement was signed for the metal wholesaler Klöckner in Duisburg on June 30th, 2008. The works council criticizes that the participation remains limited in the long run. There will be no single workers' representative in the supervisory board of the Klöckner SE, which consists unchanged of six members. On the other hand, the SNB could succeed with a SE works council consisting of 21 members. Delegates from the EU meet twice every year, also from countries with very little staff. It is conducted by a select committee consisting of five members. European Company as threatening potential? ”Say quietly goodbye when parting -- the co-determination from the German view crumbles." So writes the German economy magazine Capital on March 21st, 2008. In the title it reads that through the European company (SE) employees like politics can be better kept in check. Fact is: there are several problems for the employees' side at the transformation in a SE. Though the EU legislation protects the current participation standard, but simultaneously it is however frozen in the SE for all the future. Companies only just under the limit of 2,000 employees avoid growing into the equal co-determination with the SE transformation. Large stock companies can reduce their supervisory board from 20 to twelve members. The political-economic spokesman of the SPD group in the Bundestag, Rainer Wendt, therefore fears: “In the long run we will have only SE”. Lower standards in comparison with the German co-determination laws, clearly arranged group structures, easily movable capital are the reasons. “Primarily the SE can shift the seat more easily abroad -- an important argument in future discussions on laws, job reduction and privileges”, Capital writes further. The SE works council of the French reinsurer Scor was invited at short notice for a special session on July 3rd, 2008. Central management announced the reduction of 200 jobs, what means one eighth of the staff. The staff cuts are apparently part of the transformation into a European Company (SE) in connection with merger and restructuring processes in Germany and Switzerland. Scor had concluded a SE agreement as the first company according to French law in May 2007 (see report in EWC News 2/2007). The SE works council wants to engage a consultancy firm to analyse the financial data and work out a sound alternative concept for the plans of central management. For the workers' representatives the complete legal form of the SE is politically put to test. On March 25th, 2008 a worldwide framework agreement was signed for the French chemical group Rhodia in Paris, which is more precise in its wording than the old agreement of 2005 (see report in EWC News 1/2005). New is the formation of an international working group on safety at work including an external expert. To check the compliance with the agreement locally, a commission visits a certain country every year. In October 2007 China stood on the programme, Brazil will follow soon. At the EWC meeting on April 8th and 9th, 2008 in Paris a declaration between central management and the EWC of the car rental Europcar was signed, which confirms internationally obligatorily minimum standards, among others equal opportunities, health and safety, right to collective representation and minimum wages. Europcar was a subsidiary of Volkswagen until March 2006 and founded an European works council according to French law only after the sale to the French finance investor Eurazeo. A worldwide framework agreement was signed between the European works council and the central management of Vallourec on April 9th, 2008. The company produces pipes for the oil and gas industry and has obliged itself with the agreement to respect international labour standards in all branch offices and in its choice of suppliers. The EWC receives a report on it every year. The Danish company ISS with 440,000 employees in 50 countries worldwide, signed an agreement with the confederation of service sector trade unions (UNI) in Copenhagen on June 3rd, 2008, which is seen as the most progressive of its kind and which replaces the agreement from 2003. Central management of the property service provider (office cleaning, reception, canteen, landscaping, safety etc.) does not only support actively trade unions recruiting members in all branch offices worldwide in future, but also provides a fund amounting 100,000 € every year to raise the work standards in particularly sensitive areas. ISS seeks to influence social responsibility of the entire industry sector with this agreement. An agreement on health and safety at work was signed for the steel group ArcelorMittal in Luxembourg on June 3rd, 2008. It provides the formation of an international committee on safety at work consisting of three employers and nine trade union representatives, which can visit factories in the whole world to improve safety regulations. The agreement had already been announced at a meeting of the workers' representatives of ArcelorMittal in Montréal (Canada) in September 2007 (see report in EWC News 4/2007). 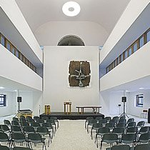 The Italian cement manufacturer Italcementi signed an international framework agreement on June 17th, 2008 with the Building and Woodworkers' International (BWI) and its European works council at the group seat in Bergamo. The agreement doesn't only apply to all branch offices worldwide but also to contractors and suppliers. It provides for the formation of a reference group under participation of the EWC, which supervises the compliance with the agreement at least once a year. Italcementi also had improved its EWC agreement in July 2007 (see report in EWC News 2/2007). Shortly before the merger with the utility group Suez (see report in EWC News 1/2008) central management of the partly state owned French gas provider Gaz de France obliged itself to recognize worldwide basic social rights on July 2nd, 2008. Foreseen is also the formation of a monitoring group under participation of the European Mining, Chemistry and Energy Federation EMCEF. Workers' representatives in Europe-wide active companies can claim funds from the European Union to deepen and improve their cooperation. An appropriate budget line has been set up on initiative of the European Parliament in the middle of the nineties to support the formation of European works councils in such companies in which the employers blockade. Meanwhile managements are using these funds however, for externally financing programmes on corporate social responsibility (CSR) (see report in EWC News 1/2006). Practically all topics, which European works councils are dealing with, are eligible. The applications can be made in spring and autumn of every year, the budget for this amounts to several million € and is provided every year. The training and consultancy network "euro-workscouncil.net" helps with the application for these funds and supports trade unions and works councils also with suggestions as regards to content. The role of European works councils at the conclusion of international framework agreements. The study is available only in English. A group of experts had worked out a study on transnational company agreements on behalf of the European Commission in May 2006 (see report in EWC News 2/2006). To this topic the Directorate-General employment, social affairs and equal opportunities presented two new papers on July 2nd, 2008. The working document with the title "The role of transnational company agreements in the context of increasing international integration" is completed by a comprehensive evaluation of agreements. The most important information about EWC work of the German railway is now available on a web page of the company. Reports on meetings, a summary of committees and structure of the EWC as well as laws and documents can be retrieved there. This web page is a joint project of trade unions and employers' federations in the sugar industry at a European level. It contains information about social responsibility of companies in this sector, EU funds for restructurings, joint declarations of the social partners, sector-specific economical data in three languages. The International Transportworkers Federation (ITF) has set up an own web site for the trade unions at A.P. Moller-Maersk, the world's biggest transport group based in Copenhagen and main activities in the container shipment and port logistics. Information about the worldwide working conditions, news, reports and documents can be downloaded there. With the EU sponsored project ZAUBER ("future of industrial relations and labour in Europe"), the education association Arbeit & Leben in Osnabrück tries to activate the debate by means of workshops and events. Main emphases are the information and consultation of employees in multinational companies, the European wage policy and prospects for industrial relations in Middle and Eastern Europe. We have arranged numerous further interesting links in a link collection. The DGB-Saar has presented now a dictionary German -- English too, in addition to a glossary German -- French (see report in EWC News 1/2007). It contains a special vocabulary which is of high using value particularly for works councils and trade unions and is rarely found in such a comprehensive form in general dictionaries. Which rights have my colleagues in the European works council in their country if they want to regulate the working conditions in the company or if they are confronted with restructurings? Many EWC members face such questions. Answers can be found in this booklet of the Hans Böckler foundation from April 2008. Five EU countries are introduced -- not only with regards to their rules currently valid in the system of workers’ representation but also with regards to a detailed historical social review. If you want more details you can revert to the thesis of Werner Altmeyer. The Hans Böckler foundation published a report in July 2008, which it had ordered after the decision of Nokia for the shutdown of its plant for mobile telephones in Bochum (see report in EWC News 1/2008). Prof Dr Ulrich Zachert examined how time and cost-intensive such a closure would be in seven other EU countries and compares this with the legal and practical situation in Germany. The booklet also contains two country case studies about mass redundancies in Sweden and in the Netherlands. As a result the author suggests to expand the information and consultation rights of the European works councils to veto rights. This book of Verena Schmidt from the employee office of the International Labour Organization (ILO) published in November 2007 bundles the work of trade union activists and scientists of the global trade union network GURN (Global Union Research Network). The book gives a valuable summary of trade union strategies in view of the globalisation. The authors inform extensively about the social partnership at a global level, global value-added chains, sweatshops and experiences from different countries (e.g. Brazil, Bulgaria, Caribbean, Colombia, India, Poland, UK, Turkey and South Africa). An intercultural communication at cross-border contacts of works councils holds a number of stumbling blocks, which can particularly impede a common strategy considerably at restructurings. At present a studies project on Airbus is conducted at the University of Hamburg under management of Prof Dr Ulrich Zachert, to which the training and consultancy network "euro-workscouncil.net" delivers support. The German train industry is nationally and internationally successful, takes a technological top position and has coped well with radical changes of the last years. After numerous cuts no more location shutdowns or mass redundancies are planned at present. Also in the home market investments are queuing now and structural effects in the freight traffic have a positive effect, foreign markets are and remain, however, essential for survival. In connection with this, the group works council of the railway vehicle manufacturer Bombardier wanted to look into the future constitution and implementation of German participation laws in the international group on May 28th, 2008 in Bautzen. Dr Werner Altmeyer from the training and consultancy network "euro-workscouncil.net" gave a summary of current judgements on European works councils with effects on the work of German central works councils. For the group works council the announcement came out of a blue sky: the Hamburg adhesive manufacturer Tesa transforms itself into a European Company (SE). On April 24th, 2008 the supervisory board decided on it against the voices of the two workers' directors. In Germany Tesa has about 1,950 employees and would presumably grow soon into the codetermination law (which means equal participation in the supervisory board for companies with more than 2,000 employees) due to a good order situation. In connection with this, Prof Dr Ulrich Zachert and Dr Werner Altmeyer have taken on the advice of the employees' side. In a convention on June 9th and 10th, 2008, temporary corner points for the forthcoming negotiations were worked out by the German central works councils together with IG BCE. Scientists, lawyers and works councils came together in the conference centre Remonstrantse Kerk of the Rijksuniversiteit Groningen (photo) on June 19th, 2008 to discuss current trends of participation in Europe. The European works councils like also the European Company (SE) were in the centre of the conference carried out together with the University of Oldenburg. Dr Werner Altmeyer from the training and consultancy network "euro-workscouncil.net" summed up the current debate on developments in EWC work in the Dutch university town. Groningen has a longstanding rich academic tradition. 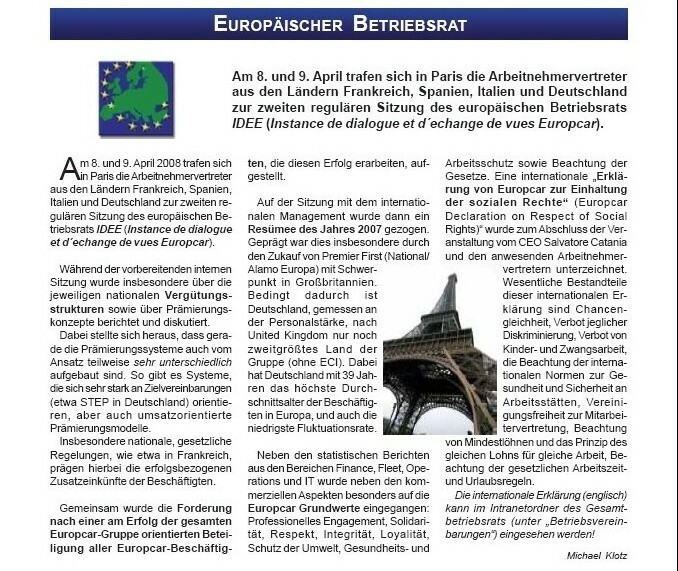 Another version of the German Austrian EWC newsletter of ver.di and GPA which deals primarily with the revision of the EWC Directive has been published on April 25th, 2008. Broader topics are RWE, Fresenius, Thomas Cook, Vienna Insurance Group, European works councils in the retail sector, protests at Novartis, a country focus on Italy, web and literature tips and event notes. The newsletter is co-organized by the training and consultancy network "euro-workscouncil.net". In the face of unlimited competition, outsourcing, offshoring, fuzzy business limits and decentralised wage policy new requirements are put on the works council. The study group Labour - Company - Politics of the Friedrich Ebert foundation wants to discuss a reform agenda for the participation at a meeting in Berlin with workers' representatives, scientists and politicians on November 25th, 2008. The look at the European level also shall play a role. On this occasion Dr Werner Altmeyer from the training and consultancy network "euro-workscouncil.net" will give a report as keynote-speaker on networked, international works council work. Further contributions are expected from Ralf-Peter Hayen, head of department “workplace participation” in the DGB federal office, Prof Dr Thomas Blanke of Oldenburg University and Andrea Nahles, deputy party leader of the SPD. The new EWC directive: what is going to happen? You can obtain or cancel EWC News here.